If you see a bear: Do Not Run. Do not surprise the bear. Make noise to ensure that the bear is aware of your presence. A black bear is not likely to attack a person unless it feels trapped or provoked. Respect the bear’s space and do not approach it. If the bear sees you, stand your ground, look as large as possible by standing up straight and putting your arms up in the air and slowly back away. If possible, go inside a building or get into a vehicle. Black bears display two types of behavior—defensive and offensive. A bear may swat at the ground or surrounding vegetation, lunge toward you, vocalize, blow air out of its mouth or pop its jaws. These defensive behaviors are used to warn you to move away. Slowly back away from the bear. With offensive behavior, the bear will move towards you quickly. If you have food with you, drop the food, and keep moving away from the bear. If a black bear makes contact with you, always try to fight it off. Do Not Play Dead. Black bears are very large omnivores (eat both plants and animals). They have a rounded appearance since they have short, thick legs, a compact body, and a short tail (approximately 4 inches long). The coat is often black or dark brown, but may have a reddish or cinnamon color. The head is large and rounded with rounded ears. The muzzle is elongated and is often tan in color. There may or may not be a small patch of white or light colored fur on the chest. Average Height: 2 to 3 feet at the shoulder when standing on all four paws; 4 to 6 feet when standing on the hind legs. 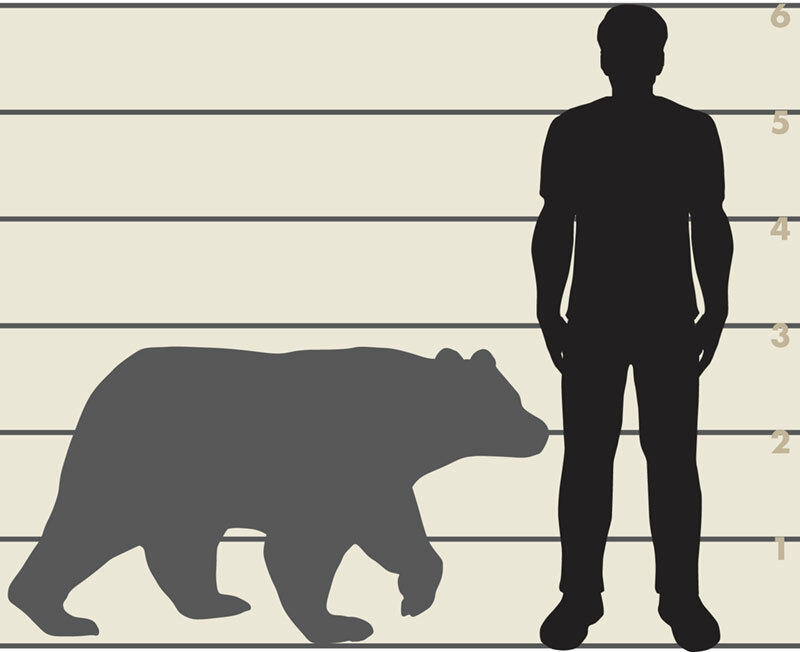 This illustration shows the size comparison between a six-foot tall man and an adult black bear. 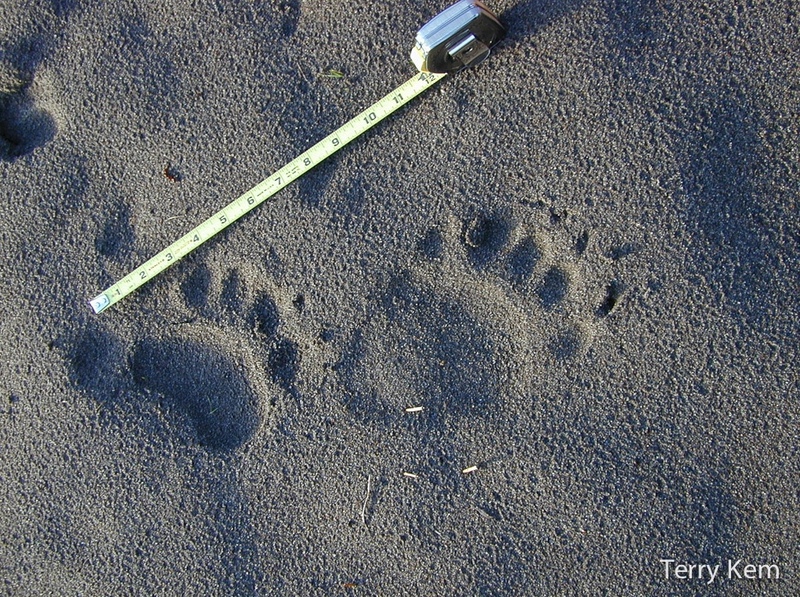 Black bear tracks are easy to distinguish from other animals, because the hind feet are larger than the front feet, and the tracks will be much larger than any other wildlife track found in Illinois. The tracks of the hind feet are approximately 3.5 to 4 inches wide and 7 inches long, while tracks from the front feet measure approximately 3 to 4 inches across and 4 inches long. 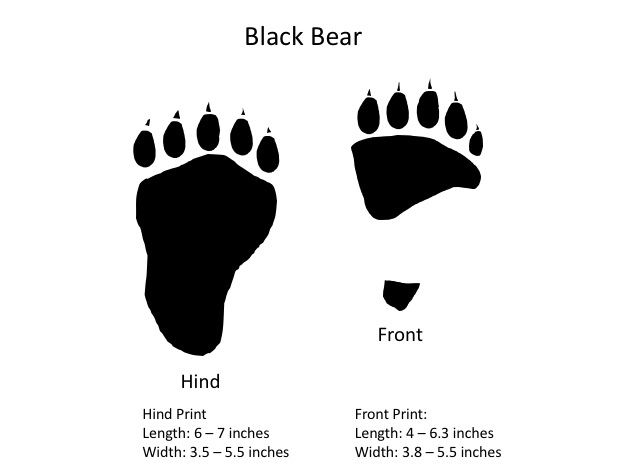 Black bears have five toes on each foot, each with a curved, 1.25 inch, non-retractable claw. Seen from a distance or during low light conditions, it is easy to misidentify an animal. In Illinois, large dogs, such as black Labrador retrievers, are the most commonly animals misidentified as black bears. Full-grown bears are substantially larger than dogs and have a more rounded appearance. Black bears also have very short tails that are not usually visible since bears keep their tails tucked close to their body. In contrast, most dog breeds have long tails. Additionally, most large dogs have slender legs and much smaller paws compared to a bear. 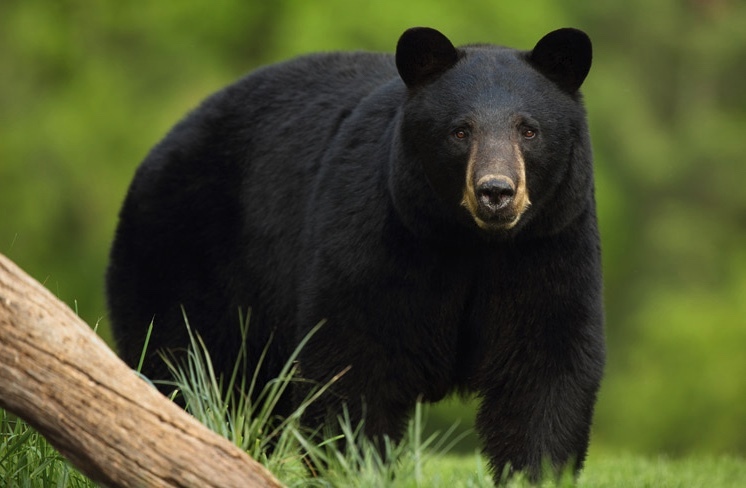 Black bears, once common in Illinois, were eliminated from the state by 1870. Black bears have been protected by the Illinois Wildlife Code since 2015. Black bears may not be hunted, killed or harassed unless there is an imminent threat to person or property. If you feel you or your property is being threatened by a black bear, contact the Illinois Department of Natural Resources (IDNR) to learn about options available to address potential threats. The IDNR may issue a nuisance animal permit and assist you with control measures. There are currently no resident populations of black bear in Illinois, but the potential exists for individuals from existing populations in Missouri and Wisconsin to travel into the state. To date there have been three bears confirmed in Illinois in the past few years. In 2008, a black bear was sighted multiple times moving through Bureau County. On February 3, 2009, officers from the Illinois Conservation Police, along with the assistance of a wildlife expert from the Quad Cities, captured the black bear, which was then transported to a USDA licensed facility in southern Illinois. The male bear weighed approximately 200 pounds and was in good health at the time of capture. The origin of the bear is unknown, but based on its condition at capture, biologists suspect the bear had been in human care prior to its release or escape. In June 2009, a black bear wandered down the Iowa side of the Mississippi River, crossed into Illinois near Savanna, wandered north through Carroll and Jo Daviess counties, and then crossed into Wisconsin. On May 26, 2014, a black bear was photographed at a residence near Galena in Jo Daviess County. The bear made its way east past Stockton, Freeport, and Rockford. On June 10, 2014, it was located north of Belvidere in Boone County. It headed south and was seen near Genoa in Dekalb County. The bear then travelled past Rochelle, Chana and Morris in Ogle County. It returned to Jo Daviess County by late June. Several unconfirmed reports of black bear have been received in northern Illinois since that time. If a black bear is reported in your area: Do Not Feed the bear. Feeding a bear will lessen its wariness of humans and may encourage it to approach people, which will only cause problems. Bird feeders and grills should be stored inside at night or when not in use, and food residue should be cleaned up. Garbage should also be secured and stored inside where possible. If you have recently seen a bear in Illinois, please report the sighting to the Illinois Department of Natural Resources. Reviewable evidence is very helpful during efforts to identify the animal and the location. Please provide any documentation including original images of individual animals or tracks that you were able to obtain. When documenting tracks or other sign, be sure to photograph individual tracks as well as groups of tracks. Include in the image an object to aid in the determination of size including a ruler, tape measure or common object of standard size (coin/paper money, business card, etc.). Also include images of the wider area where the tracks were found, including the tracks and other local features that can be located if the tracks are destroyed. An IDNR biologist will review the information provided and attempt to use this information to confirm the species and location of the sighting.